Ask any guide or guest that works in or visits the Greater Kruger Park area, and you will find that one of the main reasons they enjoy spending time there is the anticipation of the unexpected. With animals having free movement over more than three million hectares, there is literally a chance of seeing anything (or nothing! ), and no two days are ever the same. 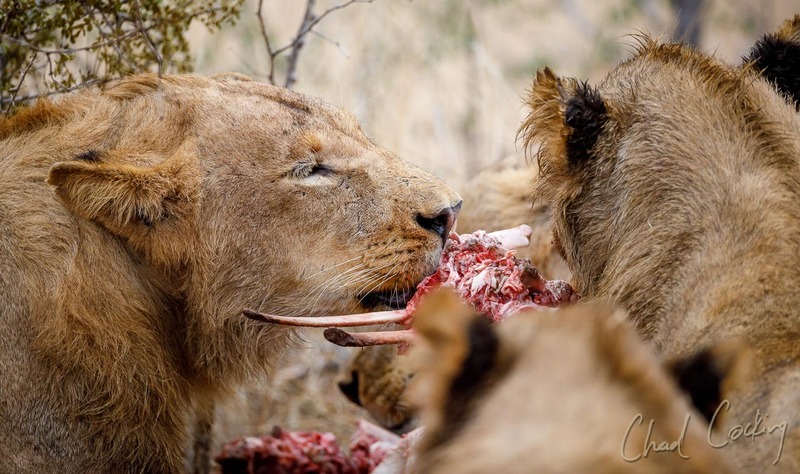 This is seldom more evident than when it comes to watching the lion dynamics at play, and here at Tanda Tula Safari Camp, we are right in the middle of some interesting and exciting times in terms of what is happening with the lions in this part of the Timbavati Private Nature Reserve. For those of you that follow this blog regularly, you will be well aware of the fact that the Zebenine Pride (read more on this unique lion pride here) recently had two cubs (born around 9th May), but even more exciting was that the second heavily pregnant female eventually gave birth during the early hours of the morning on the 12th of July – very welcome news on my birthday – and now the wait to see the new cubs for the first time starts again! Seeing lion cubs is always on the top of the list for those who set out to experience an African safari. Based on the size of her belly prior to giving birth, we are hopeful that there will be at least three or four cubs in her litter, which will go a long way to helping grow this pride. The pride itself is a small one, with only two adult lionesses. Where they come from originally is unknown, and they have undergone a recent name change in light of the fact that we were able to ascertain that they did not originate from the Ross Pride as was previously thought. They appear to have come from the Western Klaserie, but more than that would be pure speculation. The lionesses are young and these litters are likely the first for both of the females. As they have both chosen the Zebenine riverbed in the Timbavati as the birthplace for their cubs, we deemed it appropriate to use this riverbed as the name for the growing pride – one we hope will flourish over time to take over the territory long held by the departed Machaton Pride. 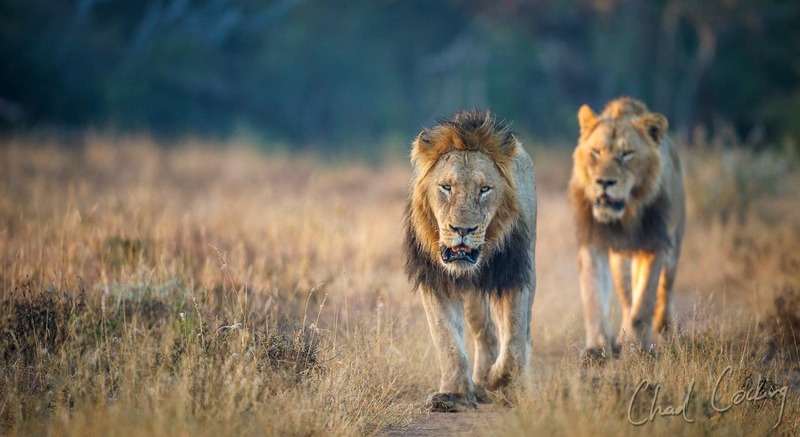 In charge of the Zebenine Pride’s territory are the two Mbiri male lions who originated from the Manyeleti Nature Reserve to the south of the Timbavati. They are the two remaining members of a coalition of three that left their Natal Mbiri Pride and moved into the Kruger National Park. Although the Mbiri males have spent most of the last year courting and mating with the two Zebenine females, from a purely human-centred point of view, now that the cubs have been born, they seem to be neglecting their fatherly duties! With both Zebenine females off the market from a breeding perspective, it appears as though the Mbiri males have been off looking for more mating opportunities elsewhere. 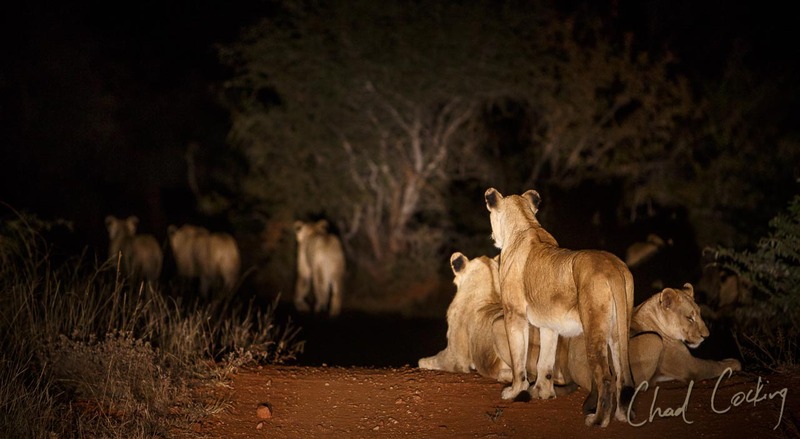 These males have been almost completely absent from the area for the past three weeks, and it appears as though their search for more females to court has brought them into conflict with other male lions. 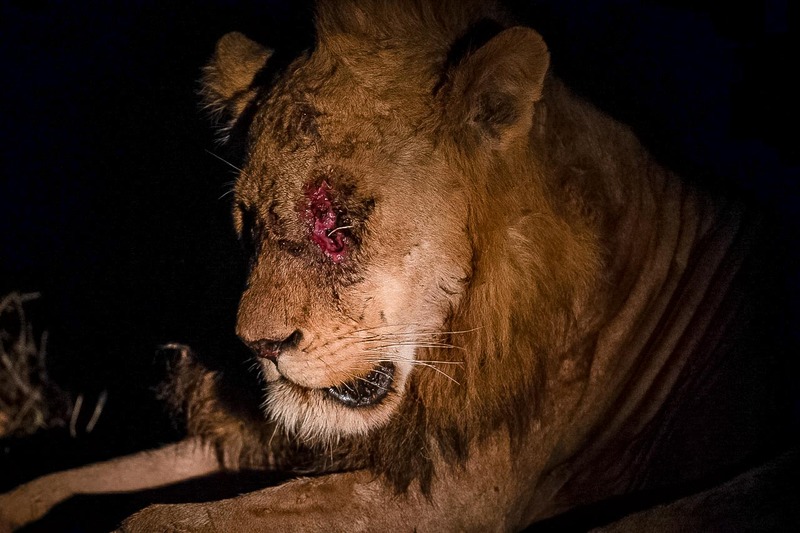 Upon the first of only two visits in recent weeks, it was discovered that both males had been in the wars, with there being fears that the younger male had lost his left eye. Fortunately, subsequent sightings of the boys (more than 12km south of the den site!) showed that his eye was still intact. 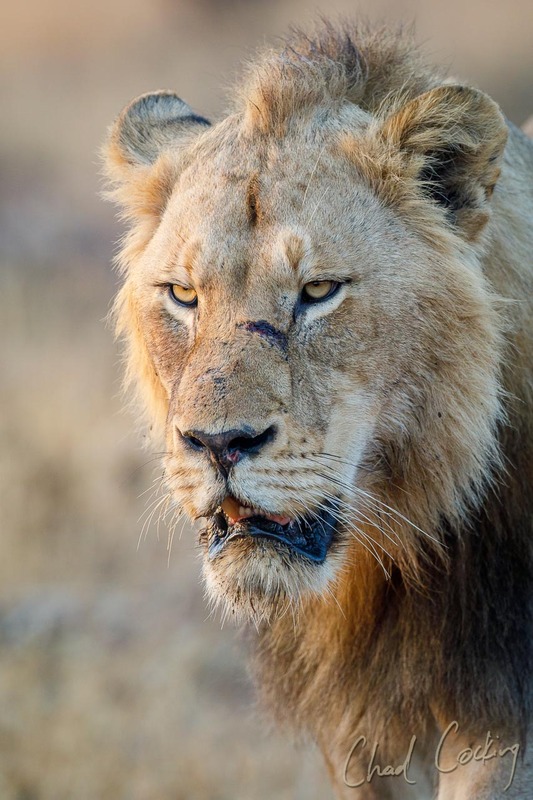 The bigger male was also battered and bruised, but this fight didn’t do anything to keep them in the core of their territory, and after that brief visit they disappeared again. The nights that a month ago were filled with the roars of lions are now largely silent... until two nights ago that is, when the whole camp was awoken at 03h06 with the mighty roar of one of the Mbiri males in the riverbed to the north of camp. Sadly though, silence returned the following evening as the male moved out of the area without being seen. Exactly where they have been disappearing to is uncertain, but it appears as though the Mayambula pride to the south-east of Safari Camp might be the target of these males as their tracks have been found in this pride's territory. Unfortunately their presence in this area does not bode well for the two four-month cubs recently born to this pride. However, from the Mbiri males’ perspective, the Mayambula pride with five adult females in their midst, would be a perfect pride to take over. Needless to say, since the Mbiri males have been spending time in the south-east of our concession, signs of the Mayambula Pride have been far less in evidence. With the Mbiri males’ movements focused away from the Zebenine Pride’s territory, this is where things start getting interesting. With the absence of the of the two Mbiris presence, the somewhat nomadic portion of the River Pride have started pushing deeper into our concession on a more frequent basis. This is something that they were not doing with such regularity before. 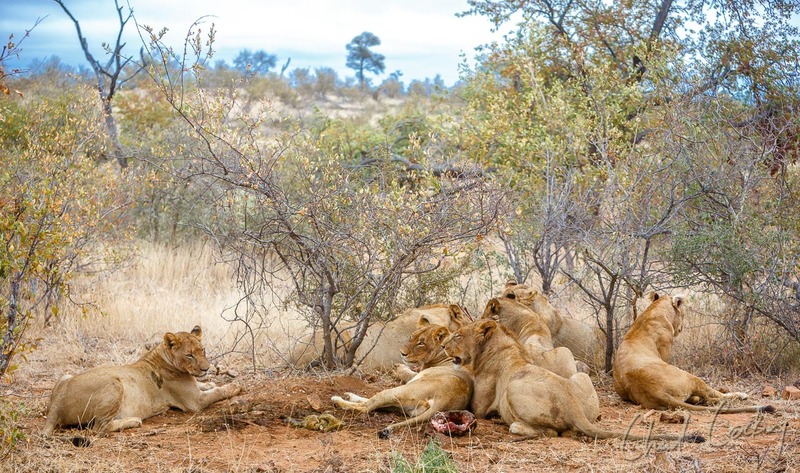 In the past few weeks the nine members of the River Pride (five young males and four females) have twice walked right past the Zebenine Pride’s den site. 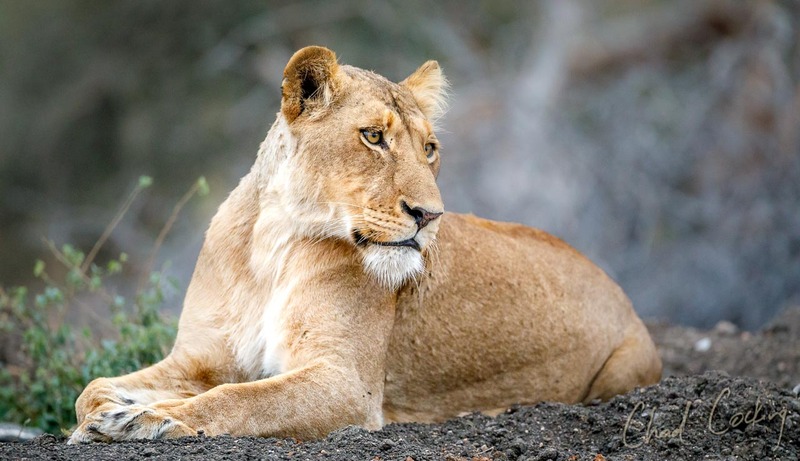 It was the second occasion that actually caused the mother lioness to move the cubs to a new den for a short period before once more returning. If these nine River Pride lions were to encounter the cubs or the two Zebenine lionesses, the outcome would more than likely be bad for the latter. Exactly how long the River Pride will stay around is up for debate; they originate from a larger pride of 18-odd lions in Klaserie, and their wanderings often take them back to the west. That being said, they do appear to have carved out a space for themselves in the Timbavati. This includes the northern third of our concession, as well as more territory north of our boundary – it was actually in this area that we saw the pride on a giraffe kill this past week. With the hunting success that this pride is showing, we can expect them to be a force to be reckoned with in the future. However, without any dominant pride males, they will be doing their best to avoid the larger Mbiri males – when they return that is! Hopefully it will be soon, as the longer that they stay away the greater the chances are of the River Pride pushing south and encountering the Zebenine Prides’ cubs. Further to the west The Hecules Pride with the Sumatra male make the odd appearance, but for now they pose no immediate threat to the Zebenine Pride. The two Ross females spend more time to the west of the Timbavati and it appears that they too might be pregnant courtesy of the Mbiri males that have been seen mating with them over the past months. So, despite having two prides, it would seem that this is still not enough for the Mbiri boys, and their search for more mating continues. My concern is that they are spreading themselves too thinly over a very large area and this may provide a chance for other lions to pop in and undo the stability that has been settling over the area for the first time in years. Maybe I am underestimating the powers of these two young Mbiris. I hope I am proven wrong, but I do fear that if their absence continues, the lion dynamics of the area are going to continue to change, and maybe not for the best. I guess only time will tell, but you can be sure that you will be able to read about it here on the Tanda Tula Blog.